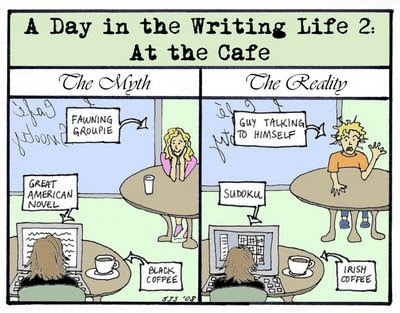 Since I've been pretty well stuck in a king-sized vat of fiction writing nonproductivity, I bring you this cartoon. Apparently I like to glorify procrastination. A few promo items which crossed my desk last week: We've talked here before about the awesome Rock 'n' Roll Camp for Girls which takes place in Portland every summer. Now, get the behind-the-scenes story, as well as advice, lessons, and more, with a new release from Chronicle Books. I like to plug the rock camp--an 11-year-old friend of ours went last summer and loved it. In other news about summer activities, I found out I'll be out of town for this summer's YPulse National Mashup Conference--very disappointing, since it's in San Francisco and sounds like it'll be a great chance to hear about current trends in YA publishing. Lastly, I've not had a lot of time for blog reading (or blog writing, or blog anything) this past week, but I did run across this fabulous list of Futuristic, Speculative, Science Fiction and Dystopian Fiction for Young Adults on Jen Robinson's Book Page. Right up my alley...which is evidently a scary, disturbing, alien-infested sort of alley. Hah! I know that first one is myth but I'm also horrible at sudoku and can't write in public! So much for the adoring fan, too. Hee, hee. My screen would have Scrabulous on it, though. More myth! Less reality! We should show that toon to everyone who says, "Oh, I've always thought about writing a book myself . . ."